If you’re familiar with Monaco, you’ll also be familiar-unless you’re very rich or very lucky-with the neck ache you get from looking up at those enormous motoryachts. Last time I was in town, I got lucky: I was looking down. On one side there was Mohammed Al-Fayed’s 208-foot Sokar. 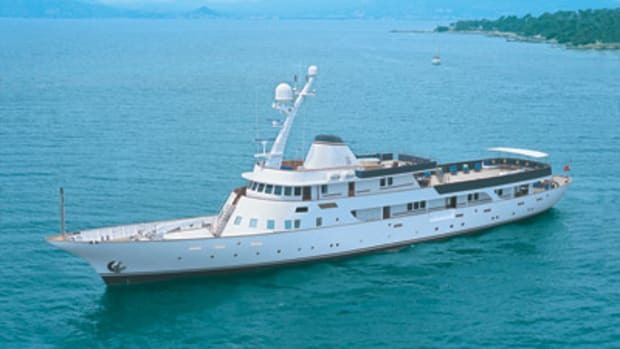 Beyond her was Wedge Too, the Starck-designed 213-foot Feadship which, to my eye anyway, is about as attractive as her name-and not much better looking from above. 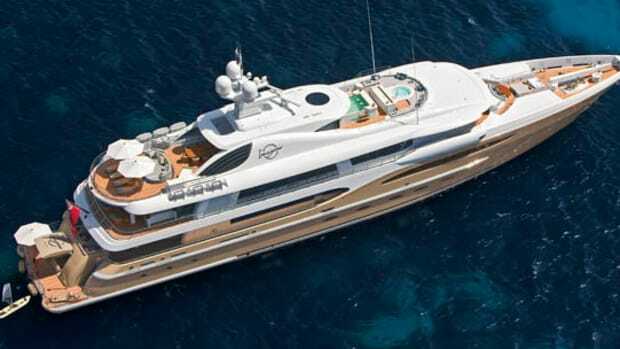 On the other side, the Bannenberg-designed 50-meter Benetti Multiple, whose elegant lines were hard to appreciate because pretty much all we could see was the upper deck. When the dashing, gold-colored 150-foot Palmer Johnson Hokulani (see "Golden Girl," page 118) arrived and started backing into her berth a few yards down the Quay Albert, she looked like a speedboat. I was aboard Martha Ann, every inch a megayacht. 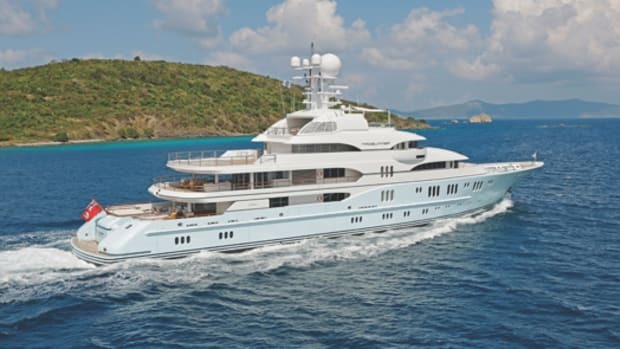 At 70 meters (230 feet), she qualifies among "America’s 100 Largest Yachts." With six decks and a whopping 42 feet of beam, she comes in at no. 13. We were lords of all we surveyed-almost. This was Monaco, where someone always has a bigger yacht than yours. As we dismissed the mooring divers and ghosted towards the harbor mouth, we had to sneak past the imperious stem of the 344-foot Lady Moura. Can’t win ’em all. Outside the harbor, we stopped. It took me a while to notice-even on the lower decks there was no sound to suggest we were at sea. But Capt. Stewart Fontaine explained that we were bringing in the fenders. Or to be more accurate, one particular fender, rigged amidships on a sliding track, whose recovery required an agile crewman in a rock-climbing harness. It dawned on me that one reason Martha Ann feels so spacious inside is her full-beam accommodation, from the sundeck all the way down to the crew mess at the waterline. Open side decks are so last century. 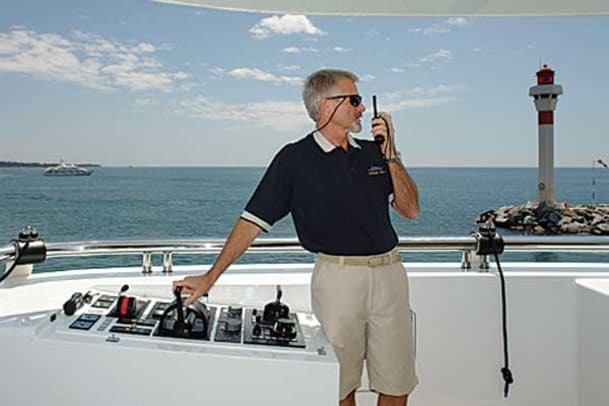 Fontaine had only joined the yacht a month before my visit but already seemed in total control. The day after moving aboard in Bremen, Germany, where Lrssen is located, he took command as the she set off on her delivery trip to the Mediterranean, straight from sea trials in the Baltic. That doesn’t sound like a lot of time for acclimatization. 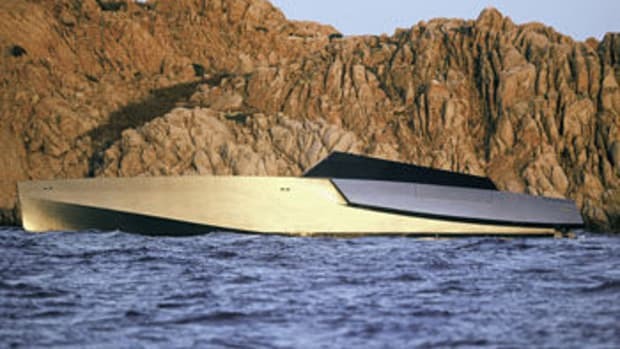 "You trust your engineers on a yacht like this," Fontaine explains. 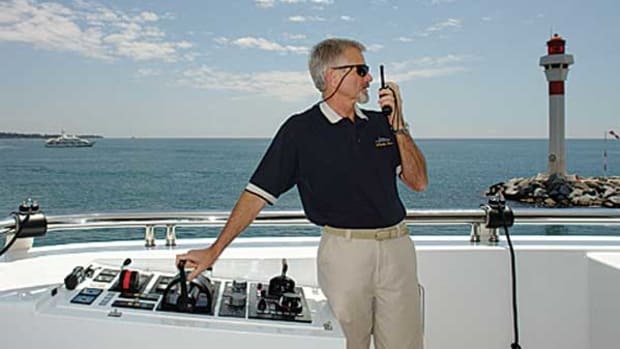 "The days of a captain going down to the engine room to fix something, especially on this kind of boat, are long gone. I never pick up a tool except to polish it." 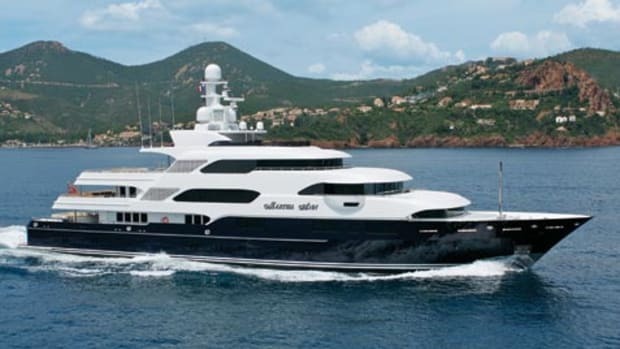 With her owner and friends aboard, Martha Ann’s maiden cruise last spring took in the Cannes Film Festival, Bonifacio in Corsica, then Rome, Genoa, and St Tropez. The American owner was due back aboard with his family later in the summer, but until then the yacht had a busy schedule to fulfill-at W650,000 (about $1 million) a week, she’s one of the most expensive on the world charter market-before crossing over to Florida for the autumn, for duty as mothership to the owner’s Viking sportfisherman. 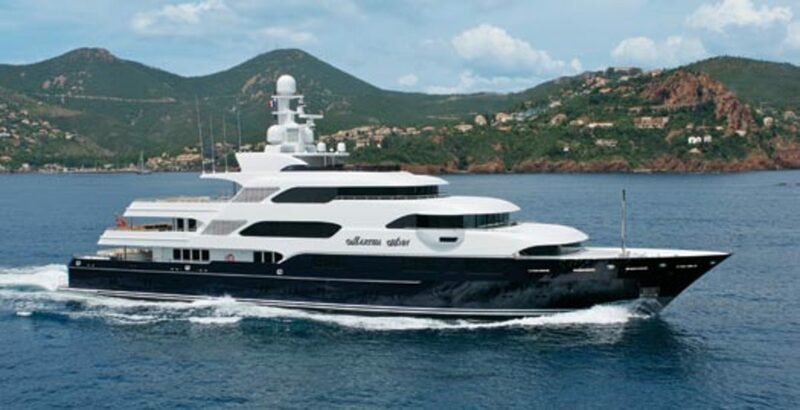 Remarkably, Martha Ann is one of a series of three sisterships, all designed by Espen ino for the same owner. He sold off the first two before completion-Apoise in 2006, St. Nicolas last year-and kept what he presumably feels to be the best one for himself. 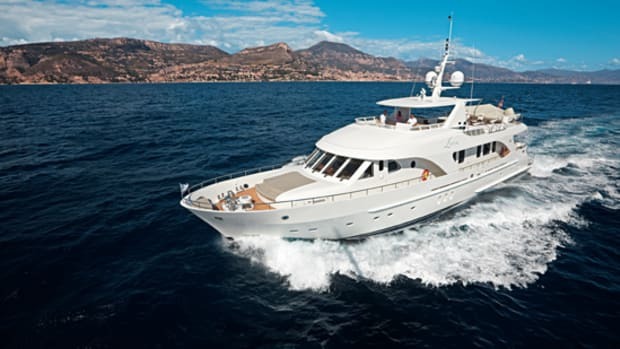 With fenders stowed, we set a course down the coast for Cannes. "We cruise at 13 to 13.5 knots, at about 1300 to 1350 rpm," says Fontaine, who hails from Ohio and got into yacht captaincy via the dive-boat business. "The ‘sweet spot’ for long-distance passagemaking is 1250 rpm, when we’re using just 300 liters [79.3 gph] an hour," he adds.